Do you host your own in-house Exchange E-mail Server? Would you like to extend the benefits of your current email messaging solution to your mobile workforce? We offer comprehensive BlackBerry Enterprise Server Installation Services for New Jersey and the Metro area. The BlackBerry Enterprise Solution provides two-way wireless synchronization to email; calendar, contacts, tasks, notes; instant messaging, web-based enterprise applications and services. Advanced Security Features — BlackBerry Enterprise Server delivers end-to-end Advanced Encryption Standard (AES) or Triple Data Encryption Standard (Triple DES) encryption that helps ensure the confidentiality and integrity of wirelessly transmitted information from behind the firewall to wireless devices in the field. With support for more than 100 over-the-air wireless IT policies and commands that enable IT administrators to wirelessly enforce security settings, BlackBerry Enterprise Server meets even the most stringent IT requirements. Simplified Deployment and Management — BlackBerry Enterprise Server helps increase IT productivity and reduce administrative overhead by enabling centralized control and management, including role- and group-based administration capabilities. 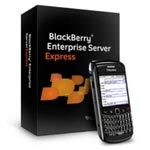 Applications — BlackBerry Enterprise Server is the leading wireless platform for wireless email, Personal Information Management (PIM), instant messaging (IM) and other corporate data. With the majority of customers accessing non-email content while in the field, BlackBerry Enterprise Server is proven in delivering more than email to mobile users. Cost savings — Leverage your existing investments in applications and infrastructure to maximize your investment and lower your Total Cost of Ownership (TCO). Standards-based protocols and development tools included with BlackBerry Enterprise Server allow you to leverage your existing technology investments.